When Steven and the Crystal Gems made a point of telling Connie, Peridot and Lapis Lazuli to protect the planet just before embarking on their mission to rescue Greg from the Zoo, I immediately concluded that something would happen “meanwhile, back at the ranch.” The only question was what that would be: Something dark? Something light-hearted? A little bit of both? In hindsight, “The New Crystal Gems” turned out exactly the way we should have expected, following in the footsteps of the show’s previous “comedown episodes”—a category that includes the likes of “House Guest,” “Full Disclosure,” “Same Old World” and “Kindergarten Kid.” Steven Universe fans sometimes argue about the show’s pacing, with particular emphasis on the ratio of so-called “slice of life” episodes to plot-moving episodes, especially as the overarching story becomes more interesting. (My own opinion is that the ratio works most of the time.) But the comedown episodes, as low-stakes epilogues to intense arcs, are some of the show’s most balanced in this respect. They help to solidify the lasting impact of what has just happened, both narratively and emotionally, and they allow for humor and normalcy to nose their way back into the picture while still providing a canvas for important character development. What most obviously separates “The New Crystal Gems” from the other comedown episodes is its near-total lack of Steven, and without the show’s heart, there’s not nearly as much sentimentality or as many feels to be had. But that proves to be a good thing for this episode, because the Connie-Peridot-Lapis dynamic is a total blast and allows for some very cool and very funny aspects of the episode to shine. I’ve talked plenty about Rebecca Sugar’s songwriting in these reviews—witness me going ga ga for Patti LuPone just last week—but to this point, composers Aivi & Surasshu haven’t received their due. That changes now, because the music they created for “The New Crystal Gems” is the epitome of their brilliance. For those who don’t know, not only has Steven Universe designated an instrument to represent each of its main characters (much as Prokofiev did in Peter and the Wolf), but many characters also have an associated musical theme, a short melody called a leitmotif. For a great overview of the musical elements related to the main Crystal Gems, check out this YouTube video (h/t io9). It doesn’t discuss leitmotifs, but it does provide a really nice explanation of why Garnet, Amethyst, Pearl and Steven might be associated with synth-bass, drums, piano and chiptune, respectively. 1. Peridot’s theme dominates from the moment Connie discovers her and Lapis in the beach house bathroom, as befits her bossiness. We hear her signature sine wave the most over the course of the episode, because the New Crystal Gems are her idea and dammit if she’s not going to keep control of her teammates. 2. Connie and Lapis each get their themes in when they speak during the initial bathroom meeting, but they’re soon overwhelmed by Peridot and her sine wave. We also get a fun little chiptune chord to represent Pumpkin. 3. When each of the New Crystal Gems steps into their roles—Peridot as Garnet, Connie as Steven, Lapis as Amethyst, Pumpkin as Pearl—we hear the original Crystal Gem’s instrument. 4. We hear a cute little version of the main Crystal Gems theme as the New Crystal Gems rush to the rescue. 5. When the New Crystal Gems successfully clean Mayor Dewey’s truck, their instruments flow seamlessly from one to the next: first Peridot’s sine wave as she levitates the truck, then Lapis’ industrial synth as she provides the water, then Connie and Pumpkin’s chimes and chiptune as they do the drying. 6. When they return to the car wash, the ominous, dissonant chords suggest that the team will fall into dysfunction… and that’s precisely what happens. Connie’s chimes intercede for a moment, but Lapis’ decision to seize control and become “the Garnet” coincides with her scary industrial synth and drums seizing control of the score. Disaster soon follows, and Connie’s chimes are insufficient to “Steven” a solution—they leave the situation unresolved. 7. The argument continues unabated back at the beach house until Connie has had enough, at which point her chimes take the lead. When she finally gets Peridot and Lapis to understand that they have to be themselves instead of imitating the real Crystal Gems, Connie’s theme plays her triumph along. To cap it all off, Peridot and Lapis’ themes enter on their respective instruments, and now that they’re all honest with themselves, they can go about cleaning up the mess they’ve made. Some happy, conciliatory music shows Greg’s satisfaction with the new sign they’ve fashioned for his car wash. The real genius of Aivi & Surasshu lies in the fact that all of the above transitions happen in merely 11 minutes, and yet the score doesn’t feel choppy or forced-together. There’s a smooth, flawless interweaving of instruments, melodies and moments, and the result is a magnificent piece of wordless storytelling. Part of the reason I chose to focus on the music this week is that “The New Crystal Gems” is more fun than emotional, though that’s not to say it contains no revelations. The most notable of these is that holy moly, Connie has come a long way. When Steven met her near the beginning of the series, she possessed no self-confidence and no friends. 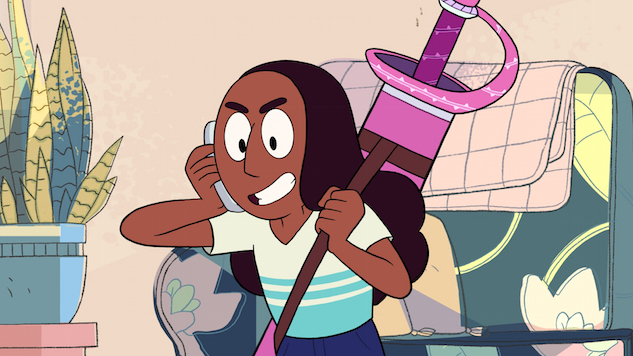 Now, she might be the most self-assured character on the show, a trait that manifests itself in blunter honesty and more forceful leadership than Steven possesses. We saw this applied to Steven himself in “Mindful Education,” but the fact that she can, without hesitation, dress down Peridot and Lapis—both of whom are far older and more powerful than Connie—shows definitively that she’s on par with the Crystal Gems in more than just swordplay. This episode does a nice job of roasting its main characters, as befits any role-playing episode of any television show. Some of the best jabs: Peridot’s complaint that Connie didn’t even cry at the end of her Steven speech, Peridot’s suggestion that she isn’t as uptight and sensitive as Pearl, Lapis’ imitation of Amethyst’s oft-disgusting behavior. Lapis and Peridot’s mutual desire to play Garnet isn’t so much a roast as it is an indication that all of the other Gems envy Garnet’s cool leadership and complete self-satisfaction. Perhaps if (when?) Lapis and Peridot fuse for the first time, they’ll discover what it’s really like to be Garnet. The three main voice actresses of “The New Crystal Gems”—Grace Rolek as Connie, Jennifer Paz as Lapis and Shelby Rabara as Peridot—all crushed their performances. Particularly Rabara, who takes Peridot through an awe-inspiring litany of shades of condescension and Napoleon complex. Zach Blumenfeld started his journalism career as a music writer, so he found this review exceedingly fun and somewhat nostalgic. Follow him on Twitter.